← Welcome Wagon ~ Time to begin a new year!! 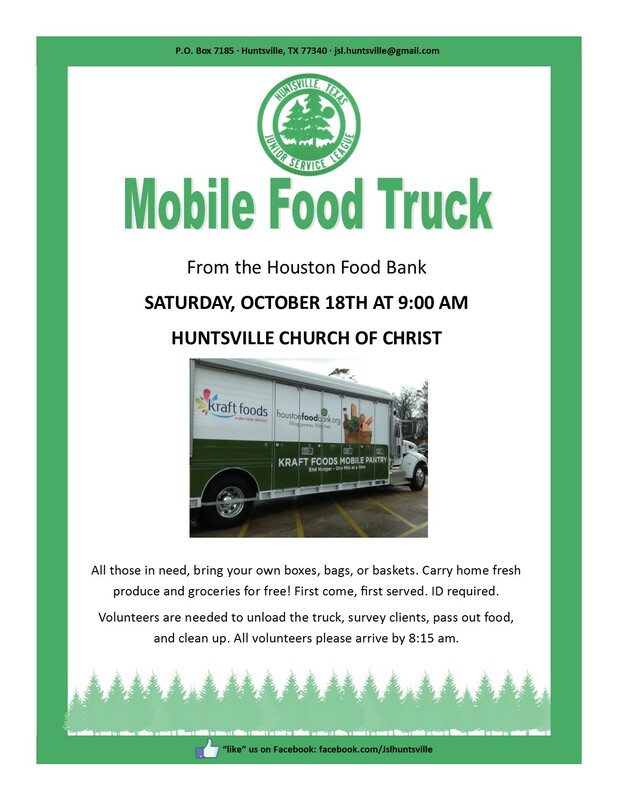 The Huntsville Junior Service League has a fantastic opportunity for our community to ban together to serve those less fortunate. We have arranged for the mobile food truck from the Houston Food Bank to come deliver food to those in need. The Huntsville Church of Christ has graciously partnered with us – giving us great support, a large space and the ability to move inside during inclement weather. Please consider joining us in reaching out to the community and extending a helping hand. We can use all the muscles we can get! Please share this flyer with all those who may be in need of help or would like to work alongside the JSL and HCOC to make a huge difference!